Recaps: 2018, 2017 (missing), 2016, 2015, 2014, 2013, 2012, 2011. 12/15/2018 -- Added link to an interim view this year. Somehow, missed this task at the end of 2017. 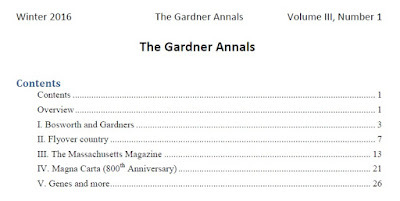 This post introduces the fifth issue of The Gardner Annals (Volume III, Number 1). This issue covers several topical areas in order to provide status of ongoing research. As well, we look at future work directions. The following is a snapshot of the Table of Contents. 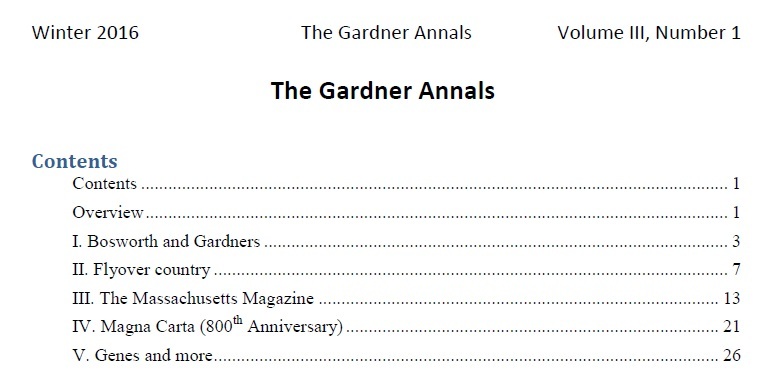 The Gardner Annals (list view) supports the interests of the Thomas Gardner Society, Inc.'s purpose: to honor the accomplishments of the Cape Ann party and to promote, and to sponsor, scholarly research of a cultural, biographical, historical, and genealogical nature, with an emphasis on, but not limited to, the origins and the lives of New England immigrants. Submissions of articles for consideration are encouraged: algswtlk[at]aol[dot]com. 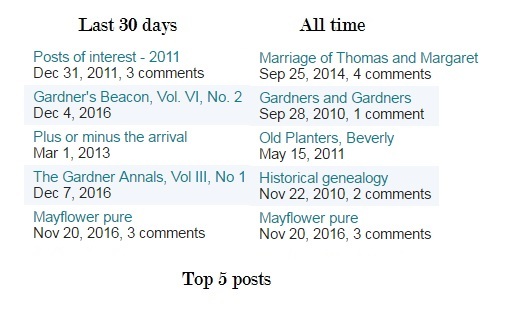 This issue of Gardner's Beacon briefly looks at research that will be reported in the next issue of The Gardner Annals (to be published, Dec 2016). In particular, there will be detail provided about Gardiner and the Battle at Bosworth. David T. Gardner will give us an overview of what he has discovered. This material relates to our interest in the whence issue. In Flyover Country, we follow families from Massachusetts and Virginia as they move west. In other words, this is an example of the pathways that were described in Albion's Seed. From a lonely grave site out west, we follow back the generations for the preceding 200 years to early New England (north and south). The Massachusetts Magazine will be featured regularly. TMM was published by Dr. Frank and his sister, Lucie M. Gardner, whom we introduce. Lucie was a graduate of Tufts in 1897 and active in a lot of areas. She contributed to all of the issues of the TMM. 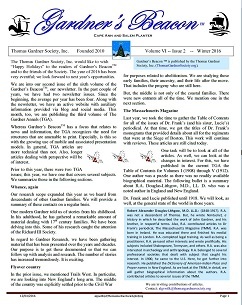 This Gardner's Beacon issue provides the Table of Contents for Volumes I through V and discusses some of the articles. We also introduce R.A. Douglas-Lithgow, M.D., LL. D. who submitted several articles. This preeminent researcher and author came over here late in his life. He wrote the definitive history of Nantucket. Additionally, a guest writes in this issue about the Magna Carta and the celebration that occurred in the summer of 2015. Then, we start a series on DNA and its issues as they relate to general subjects such as what we know and admissibility of such. See Vol. VI, No. 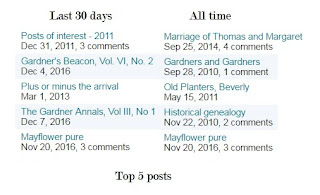 2 of Gardner's Beacon for a review of research to date. 03/01/2019 -- We're building an index via images for our portal to truth.